to confer with an elf! If you have a vexing question about writing, editing, illustrating or designing a story, please do send it along to our workshop! We will reply as often as we are able. Gelila, we adore the idea of a fairy tale about a fairy who needs help! Fairies have magical powers, so perhaps her powers have been taken away in some way? We have two suggestions for how to imagine what comes next. One is to consider what fairy tales are. Often they are created for children, often they include magical beings and creatures, and they usually are set in places that no one has seen. Many begin with “Once upon a time…”, which we elves take to mean a time long ago. Furthermore, anything can happen in a fairy tale. There is no event too curious or unlikely for a fairy tale—which makes this kind of story a great favorite of the elves. Our second suggestion is as follows. When a writer is unsure about what to include in a story, we highly recommend the writing of a Wish List. A list of all of the most enchanting ideas that you have will help the story fall into place quickly. This tip will explain further: how-do-i-find-a-topic-to-write-about. Inventing a story is one of the most pleasurable and exciting things elves do, so we hope you enjoy it immensely (the-joys-of-inventing-a-story)! Three times the charm! So, the LPS series that I mentioned in my last question ended up becoming a story! However, I'm struggling with the plot and I am currently also stuck on who should be the protagonist. Should The Dream Prince or an outsider fit the role? Also, I have a few other questions about some other projects. I have a story called "The Spirit Boardwalk," and I have only just recently decided that a former antagonist should become a scheming protagonist who attempts to kidnap a person to, as he puts it, 'transform into a spirit,' in a last bid in order to save his vacation destination for ghosts and other supernatural entities. It's supposed to take place during the first golden era of the amusement park and the boardwalk, which is in the early 1900s, which is before the First World War. How do I establish this without any of the characters outright saying that it's 1902 or something like that? Also, perhaps give me tips on establishing a world where humanity is extinct almost everywhere (yet the main character's species is descended from them), where magic is put into two categories (one that is a resource and another long-gone type that acted almost like radiation), and where the continent that the main character lives on is in the middle of an industrial and technological revolution (with guns, factories running on magic, a recently formed democratic system, and a somewhat complex trading system). Thank you for your time. That your ideas are turning into stories! This is brilliant news!!! That you are so sensitive to the ways of storytelling that you desire the story to very naturally open up a time period. Your questions are written so beautifully that we know your stories must be written beautifully, too, and packed with details. After celebrating, however, we got to arguing. Elves often argue, and usually we do this when we are trying to resolve too much at once! Some went off in a huff, and others stayed to argue more! It was quite a mess, but elves are very temperamental and this is why we are so in need of Brain tips, which we hope you have noticed in the workshop. Chloe, my dear, we do not have answers to all of your questions because elves must work on small pieces of story at a time. We might well jot down some big ideas for a story, but when we get down to writing, we work on very small pieces. Otherwise we get irritable, overwhelmed, and then we freeze and fail to make progress. – Protagonists are main characters, and storytellers have to spend a lot of time with main characters, as you know. We suggest that you choose for your protagonist the character that YOU ENJOY the most. – Establishing a time can be done precisely in the way you mention, by describing the events and features of that time. If the story describes an amusement park of 1902 and what that was like, then you have done the work of establishing a time period. – Establishing a world is about description, and description is done throughout a story. Describing extinctions, different types of magic, and the setting for a story is all description work that builds as the story goes forward. We simply decide where to start with our descriptions, and we add to them as the story advances. This can occur quite naturally, as story events often call for further descriptions. We could not agree on answers to the question about the society with a quirk. However, there may be a tip in this for you. Be sure that you are not taking on too much at once as a storyteller. You have so much imagination to work with, yet, at the same time, it is very good for storytellers to give themselves an amount of work and a degree of focus that allows them to finish. Finishing creates a priceless confidence to write the next story! We hope we have been at least a little bit helpful, Chloe. It gives us tremendous pleasure to know that you continue to write! Lexy, we are so glad to have you in the workshop! You may be interested to read the question below from Amanda, and the ideas we recently passed along to her. Many stories seem to be asking for elves and regions where elves reside. If your character has just arrived to the chilly North Pole, we recommend finding a place to sit comfortably and quietly. Waiting to see what arrives on the scene is often a happy way to proceed with a story. To learn more about this, see the Writing tip: empty-spaces. Finally, it is often enjoyable to consider the unexpected for a story. What would you not expect to see or to take place at the North Pole? Does this direction appeal to you as the writer? Try to find what you would enjoy writing, rather than what you should write! Making a story about an elf is a noble pursuit! An elf is a character like any other, so you might begin your story planning by thinking about what kind of character you want to tell a story about. Is he or she bold or timid, is he or she old or young? Even answering a few basic questions begins to give a story some shape. As for the setting, it might be the forest. Or, you might take the story to a setting that is unnatural for an elf, such as The City. As for what may take place in the story, we always like to suggest making a Wish List. This tip will tell you exactly how to make such a list: how-do-i-find-a-topic-to-write-about. Imagine yourself in a pair of velvety elf shoes with glistening bells. Where would you go? What would you do? Standing in the shoes of a character is an excellent place to make decisions from… stand-in-the-shoes-of-the-character. The very best of luck with your story! Hello, Simon. Yes, we do receive some questions about presents, especially at this time of year. We are story elves. All elves are cousins to each other, but the elves who fashion toys for delivery on Christmas Eve are elves of a different purpose! Story elves do exchange gifts. We might ask for a new quill pen or a new roll of parchment. New dipping ink is always a popular gift. We can even ask for a part of a story as a gift, such as a good ending. This is also the time of year when story elves are matched to one another! You see, we have big elves and small elves in The Story Elves workshop, and, once a year, big elves and small elves are paired—often for life. Small elves are excellent at finding details for stories, while big elves make the larger decisions, such as what the story will be about and who its main characters will be. We hope this satisfactorily answers your questions! I have a feeling my story is not in a correct order, but I have no clue how to reorganize it. And since I do not know any professional editor, I really need help. How do I make the perfect story? Taif, we are so glad to hear from you and to hear about your story work! We can consider your circumstances one piece at a time. Stories often come out in an order that needs some reorganizing. If you think about how we talk, we often add something to what we said earlier a little later, and stories are just this way. We have a wonderful Writing tip on this very topic: moving-story-pieces. This is an extremely common problem and it takes some practice and patience to reorder stories. Yet, there can be great successes when we do this, as Zobelia the writer elf describes in the tip. As you are acting as both writer and editor, have a look at this Editing tip, which will help you see your story as a good editor would: edit-like-joble. As to the matter of making a perfect story, well, our elf elders advise that we make stories one by one, and realize that each time we make a story, we improve our storytelling skills. These two tips may help you understand this perspective: better-ideas-come-from-working-on-the-first-idea and search-for-all-of-the-improvements. Perhaps it is better to keep writing and practicing than to try to make something perfect. On to the matter of filling the space between the beginning and the end (we very much like the way you phrased this), this is the question we must answer for every new story. Elves love to begin with a Story Wish List: how-do-i-find-a-topic-to-write-about. With such a list, we prepare a gorgeous set of ideas that we genuinely like before the story is started. It is important to start small with stories. A story might be a page. It might be about a single day, as this tip explains: a-story-in-every-day. Be sure to start with small stories so that you can finish them and feel a sense of accomplishment. Stories will naturally grow longer as we are ready to write them that way. We wish you joy and adventure as you write! Zara, this is a question with many answers. The elf elders sometimes laugh at young elves when the young elves struggle with writing what we call The Old Tongue. And, of course, there are many dialects of elvish. Some story elves cannot understand the writing of other kinds of elves, which is a shame, because all elves write stories and we do not want to miss out on any of them. We suppose that if you grow up writing elvish of one kind or another, it feels easy. Liz, we have several tips that might help. Here you will find Drawing tips on inventing mythical creatures: creatures-animals. Drawing tips can be used even if you only want to write about the new species you are creating! (Note that illustrator elves feel strongly that sketching and drawing can help us create characters, as well.) Notice too the tip on this list about creating mischievous characters. This tip may be helpful, too. Two Writing tips come to our minds: villains-heroes (a tip about looking around you to find characters) and find-a-topic (a tip about writing a wish list for a story you would like to read). Good luck with these original characters and species! Perhaps set a goal to make one character. Then, when you have one new character that you like, you can set a new goal to make one more! This way, we break up our story work into smaller parts and the work never feels particularly daunting. Lily, we are so glad to hear that your confidence has grown. This is excellent news. As for your question, we took some time over it. You touch on topics that trouble a lot of writers: pressure and wanting to please an audience. At a recent meeting, several elves expressed the hope that you have seen the Brain Tips (brain-tips). In addition to the tips themselves, which are there to help us feel better, please take a look at the stone in which the following message is engraved: THE STORYTELLER FIRST. In the elven world, it is believed that the storyteller’s comfort must come first. When we feel that we have to write quickly and when we feel we are writing more for others than ourselves, the pressure can push out the imagination and its new ideas. You are wise to be aware of a problem because, with this awareness, you can take a new action that better supports you as a writer. Elf elders strongly encourage writing for ourselves, as described in this writing tip the-vip-in-the-audience . We also always suggest a story wish list as a way of generating new ideas (how-do-i-find-a-topic-to-write-about). As for the problem of pressure, one elf suggested that, in the future, you might consider writing a story to the end before sharing it with your audience. If you finish a story and then share it, you will know that you were the most important person in your audience, you will have had time to explore all of the ideas that please you the most, and you will not feel pressed to write something fast. We hope that this helps and we wish you much joy in your storytelling. Hi! I am writing a novel about 4 girls who are sisters and they have elemental powers (fire, earth, water, air). I am stuck for a name for the book. Any ideas? Thank you so much! Hello, Someone. It is nice to hear from you again. This story seems to have a found its writer! In the elven world, we do something that you might find funny. Sometimes, when we think about a question, we sit and patiently close our eyes. We wait for an answer to arrive rather than going and looking for it. Several elves read your question, and we all closed our eyes. The same answer came to each of us: we all believe that the title for your novel (or novels, should they become a trilogy) will reveal itself as you write. One story elf also reminded the others of this: sometimes, when we choose a title too early, we write for and to the title, rather than letting the story go where it should go. So, perhaps you can create a simple and temporary title, a working title, but let the final title come later, or even last. We also have a tip on creating titles, the-title-that-tempts-the-title-that-tells-the-story. All the best to you, Someone. I'm back!!!!!! :D This time I really need help with writing tips and creature naming ideas! You see, I am working on two original lps series called "Dreams During Twilight" and an unnamed series. I need help naming various 'dream creatures' and I also need help with the last name of a good guy known as the "dream prince." He watches over everybody's dreams, basically. I also need tips on how to write a children's story. This is a personal project of mine. If you want to know the story, it is about a magical being known as a Caraock named Dewdrop. She needs to control her ability to cross dimensions, which is common to her species. She ends up going into many random dimensions, so she must control her abilities to go home, with the help of some new friends! I just need tips on how to attract younger readers so that they could read the book! Chloe, it is delightful to have you back in the workshop! And what a bouquet of questions you have for us! Let’s start with the question of names. Tyler and Tristan also asked about names, so please be sure to have a look down below. We have a Writing tip about names here, as well: what-to-name-your-characters. We love the idea of a dream prince to watch over dreams, and wonder if he needs a last name? His title is so ear-catching that maybe you will not want to distract from it. Then again, have you considered synonyms for the word ‘dream’? A synonym might lead you to a name… . When writing a story for younger readers, we love to see illustrations. It also makes good sense to think about how many words will appear on each page (perhaps not too many), and how long and complicated the story is. A younger reader may enjoy a story that is quite straightforward, so as not to be confusing. Some feel that it is unwise to use big words for readers who are young, however, elves love big words, as you can see here, the-music-of-big-words. A big, musical word, here and there, can be a glorious sound to the ear! All the best with these excellent story goals, Chloe! How fascinating, Antonia! Our illustrator elves think this is a magnificent challenge! And they suggest the following: why not make a sketch of each of the items on your list. For “characteristics of living things,” “Consumer” and “Producer,” you may want to sketch some options and see which one you like the best. Then, when you have a set of sketches that captures your whole list, take a look for the parts of each sketch that interest you the most, and put arrows toward them, or circles around them. From this point, you can have all kinds of fun making a creature out of your favorite parts. Furthermore, the tips on creating mythical creatures may well be of use, because they talk about how to combine parts that come from different places. Don’t be afraid to add in your own details, too, like eyes or ears or a tail! We wish you every success with this glorious project! Just in! A new suggestion from Valkiri, the illustrator elf! Consider combining plant elements with animal elements. Molly, hello to you. As to the matter of speaking elvish, this we cannot, unfortunately, teach. We can tell that there are many different dialects, and when elves gather for big celebrations, some elves cannot be understood by each other, except when there is a relative who speaks both dialects. As to the matter of a good story plot, we recommend creating a Story Wish List, a list of things that you would love to see happen in a story, along with the characters that you most wish to inhabit the story. This tip will help, we hope: how-do-i-find-a-topic-to-write-about. We also love this tip, because sometimes writers forget to put themselves first in the audience, the-vip-in-the-audience. As for copying, well, elves have strong feelings about this. We learn from stories; we are supposed to. So, admiring a story, learning from its parts, and using elements of a story in our own writing is part of what we do to create anew. What if no one wrote another story about elves, monsters and humans? That would be a terrible shame, we think! Therefore, do not be afraid to use ideas that come from other stories. The ideas will soon become your own as you weave them into your own story. Sam, story elves have a strong belief. We believe that new stories are always possible and that there will never come a time when all of the stories have been told—because of writers like you, who seek to make something new. It is possible that some elves might disagree, but story elves feel that a story and its characters are to be decided by the storyteller. What could be more exciting for a reader than to learn there is a new kind of elf? Which brings us to another belief of the story elves: that all of the worlds that storytellers invent exist somewhere. We wish you every success with your story! We await word of these new elves! Dear Sophie, we apologize sincerely for the delay in replying to your questions. The workshop is abuzz because we are about to release a new story. Sometimes, the workshop changes from abuzz to a-mess, though. This is all very normal when new stories are nearly finished. As for what to name them, we would suggest that you might want to have a good look at something before you give it a name. So, maybe you will want to do the creating of the creatures first, and name them second. Then again, if you think of a good name, that might lead you to the creation of the creature! You could work in either direction. As far as figuring out names, please be sure to see the questions asked by Olivia of Prairie Grove, and Mr. Carrot of Zagreb (as well as the replies we sent to them, of course). We wish you every success, and please send the elves in Cheshire our warm greetings! Elves feel it is important not to interfere with a storyteller who is right in the middle of building the right ideas. Please let us know how things go! Or come! Hello, Rose. Your question is really The Beginning of a story: we have to have something to talk about, which means we need an inspiration. If you look at the very first question we elves received when we opened our workshop to humans (from Rachel in London), you will get some idea of how elves become inspired. We feel the most important thing to know is: inspiration can come from anywhere! – learning to notice and observe what is going on inside of us. If we notice what is on the outside, and we check how we feel about this on the inside, we will know if we find something interesting and inspiring. Isack, hello to you. You have asked perhaps the most important question to elves. Continuing to use your imagination, to remember that your imagination is always there, is crucial. Imaginative children can grow into imaginative grown-ups and stories can be created throughout an entire life. Elves feel that it is best to use our imaginations on a daily basis all through life. Thank you so much for writing to us from the Mediterranean Sea. Please extend our hearty greetings to the elves in this region! I am making a series on YouTube using a toy called a littlest pet shop. I need help with two things. First, I need help with a backstory for one of the main villains. Some info: he is a green koala who has some parts customized like blue eyes. He is very evil and he knows how to control the body. He often controls someone for his gain, or he controls them only for that poor person to bite the dust. (He is VERY EVIL!!) So, I need a backstory so viewers can know how he became this... mad. Hello Chloe! Your letter brought about a meeting of the elves. It poses two very interesting challenges: backstory and finding an audience for your story. Here are some ideas we thought of. Take any details that you know about the character—that he is a koala, he has certain powers, and he is mad—and then take those details one at a time to think about backstory that supports each detail. Backstory is a creative smorgasbord! Also, you will want to draft backstory ideas, just as you would draft story text. The Koala might come from Tasmania, or have escaped from a poorly run zoo, rather than originate in Australia. With your ideas drafted, you can pick your best set of ideas by mixing and matching until you love what you have. As far as finding an audience, perhaps a teacher could help. Perhaps there are competitions to enter, to show your storytelling work. Taking a class might help uncover possibilities and connections to people who can help. You can always show your work to friends and family, for a start. 1) Read poetry. Read the poems of different poets, too. From each poet, you will learn something new. 2) Don’t worry at all about rhyme. Let yourself start in another place. The effort to rhyme can sometimes take a poem in a nonsensical direction, sometimes even a silly direction. You can work on writing rhyming poetry after you feel more confident about writing unrhymed poetry. 3) Write about how something is a lot like something else. Does that fat furry bee remind you of your Uncle Harold? Is the owl you heard in the woods a bit like the way your mother sings to your little brother? Is the truck passing your house anything at all like a bully at school? 1) Reread your poem and take out all of the unnecessary words, words that don’t HAVE to be there and aren’t contributing anything important. Often, you can remove little words like “the,” “and,” or “a,” as well as words that you have repeated. 2) Try to make your lines a similar length by breaking the lines in logical places (where commas might go, or where you want to pause). Esme, this is a gorgeous question. Some of the elves just love competitions and situations with pressure! They can be an exciting adventure! There is little time, so we must get straight down to the business of strategies. First, we must commend you. You have already used one of the most excellent strategies—asking for help! • Start. Write one sentence. Write another. Notice if you feel like you are freezing in fright or putting things off, and gently and kindly encourage yourself to write, that there is really nothing to fear. • Spread the writing out, rather than rushing at the last minute. • Remember that you do not have to start at the beginning. Write what is in your mind, and let the other parts fill in as they come to you. • Try not to be harsh or judgemental about what you write, especially your early words. Everyone in the competition has the same two weeks. No one’s story will be perfect. This does not have to be the only or the last competition that you enter! Reassure yourself that this is just one opportunity to write. We really do love this question. Starting is such a pleasure. There are so many possibilities, and we can feel thrilled and excited about all of them, even if we do not lasso them all right this minute! * We write a wish list for a story, including all of the things we would wish a new story to contain. * We keep a journal of ideas and pieces, and then read the journal every so often, to see if perhaps a few of the pieces have begun to stand out and fit together. * We check very thoroughly if there is anything on our minds. Sometimes we forget to look around the mind, to see if there is an idea in there that really does want to come out. This is not uncommon. And jumbles are really OK. Elves are taught to “write what comes,” and not worry about whether it is jumbled. If we learn to write what comes, rather magically, words eventually begin to come out with more order. The important piece is to keep writing until the jumble begins to smooth out and make more sense, which it surely does. i) Sit down to write before your feelings and ideas feel like they are overflowing. ii) Write without judging. Just let things fall out any which way. iii) Practice giving yourself a topic that feels clear and contained. This is how we build confidence and skills, by starting smaller. Writing about your life and your school, things about which you know, is an extremely good idea. Yet, it really does help to narrow the topics just a bit more. Rather than writing about your life, perhaps try writing about your brothers and sisters, or your friends. You could narrow it even more than that, and write about yesterday! Similarly, if you want to write about school, start by writing about one aspect of school, possibly walking to school, the school gym, the library and what goes on there, or the cafeteria. Above all, trust—just as story elves do—that the words will eventually settle into a good order as you continue practicing and trying new things and trusting (we know that we said “trust” twice, but it is so important). Minaal, hello to you! As it happens, we have just created a new mythical creature, with the essential help of April. We hope this is helpful to you, too! Dear April, it took us a little while, but Valkiri has created a picture of this rare creature, and some information on how to recreate it yourself. See how-to-solve-the-puzzle-of-a-new-mythical-creature ! Olivia, hello from the elves! Names—names of characters, names of creatures, and names of stories—are very important to consider. Names can begin to set the stage, for each character and for the whole story. This tip, what-to-name-your-characters, is about naming characters. As far as naming creatures, well, this is a different challenge. Mermaid is a fantastic name for a creature and we can learn a lot from it. This is a Middle English word and it has two parts: mere (sea) + maid. The word perfectly captures the two parts of the creature itself, being of the sea, and being partly a girl or woman. • looking at where the creature lives, and even what time of day it comes out (the Latin word for “night” is “nox,” and nox sounds like an excellent part of a name). When you have a good set of words, you can then experiment with how those words might be combined! Names can be hard to arrive at. You might need to make a list of choices and think the choices over for a few days. Always try to be flexible and patient with yourself, and allow yourself to call the creature by a temporary name, until you have the perfect name picked out! According to the elf elders, Lilith also means “of the night.” It is this meaning that seems to suggest a way for you to connect a heroine to a villain. Perhaps Lilith isn’t the same at night as she is during the day. Maybe, during the night, she goes places that she wouldn’t normally go, and, in these places, she might cross paths with a villain. She need not resemble a werewolf in losing her good character at night. The idea is only that she might travel to different places at night, possibly on errands of peace. Lilith could also have a past. A heroine might have become noble after a very troubled past, born a demon and then transforming into someone kind because of an extraordinary event. Great characters can be made up of good and bad. They might have good and bad mixed up in the present, or they may be a character who traveled from bad to good, or the other way around! This is a very good question, and it is a very good thing to think about, but not to worry about. Let us explain further. Stories do need to fit together. The parts of a story will want to work together. This is true. Yet, arranging story ideas takes practice and time, and it is also very important to try new things and try things in different orders. It is so important to be flexible and to experiment as storytellers. We do not want to worry so much about order that we are afraid of creating some experimental disorder! If you know that it is important to experiment and be flexible (which it is), then you will allow yourself to play with a story. Every story is a new puzzle and opportunity! You might even do something accidentally that turns out brilliantly! We hope that these tips help. Norðr the Elven Wizard, we feel that the best place to start is wherever your ideas are the most sure. Don’t feel you have to take on everything at once. Start somewhere (again, wherever you feel you have the clearest picture of the story), and go from there. You might start with a scene of underground goblins and write that, and then, without even thinking about it, a collection of spirits arrive. If you keep story ideas—story pieces—in a journal, you can be sure to capture all you have as it appears in your mind. Story pieces may not connect today as you write them in a journal, but they may connect perfectly next week, when you suddenly see how to use them. And please give our best to the other elven wizards! It has been such a long time since we have all met! Hello, elves! I'm new to this website, so I have a rather simple question: What font do you use when you make articles? It's beautiful and I want to use it in writing my own stories (I'm using Mac OS X for making printable texts). Hallo, Mr. Carrot, and Welcome to the Workshop! The elves are very fond of a typeface called IM Fell, a gorgeous Google font (https://www.google.com/fonts/specimen/IM+Fell+DW+Pica). Regarding your second question, elves are extremely fortunate to be able to consult a group of Elf Elders who are expert in old tongues (because they themselves are so old). We understand that some humans enjoy the book, Wordcraft: New English to Old English Dictionary and Thesaurus, by Stephen Pollington. Mr. Pollington has written many books on the subject of Old English, in fact! Perhaps you could investigate his books further, to see if any might meet your needs. We hope this information is helpful. By the way, we admire your unusual name. Have you considered writing a story about yourself? We think you might particularly like the last two tips, although all three are worth a look! We hope that these ideas help and that the hands of your tiny characters begin to take good shape! Hello, Esme. What strong and clear ideas you have for a story! Lilith Dwake will be suprised and pleased (we hope) to learn of her elven heritage! Let’s focus first on the question of creating a new underwater creature that is less human than a mermaid. This is a good goal because it is so specific. We suggest searching for details that you like in other animals or creatures and then trying new combinations. In fact, Courtney and Keegan from Pueblo are working on a similar project. Take a look at their question, as well! You might keep the tail of the mermaid and play with the top (human) part of the character. This way, you can focus your work and not try to invent two new halves at once! As for naming a new city for magical creatures, we like to ask questions. Why is this city important? What does it stand for? What is its history? As you create some description of this city and some history for it, you may well find words that stand out in your notes and journal entries. These words might play a part in the name. We also always enjoy Old English! You could locate an Anglo-Saxon dictionary and search on the word “magic” to see what old words and colorful definitions come up. Words might be combined in some way to create an original name for a sparkling new city. We are assuming and hoping that you have seen Valkiri’s tip about creating your own mythical creature, invent-your-own-mythical-creature . Copying is an old elven tip for mastering skills. Therefore, if you print four images of different animals you like and then use tracing paper to trace the parts that you like, you can then assemble this wonderful new creature! Tracing is tremendous practice and can help build the crucial skills for drawing characters on your own. Be sure to keep your ideas and practice in a sketchbook so that you can see your progress (and this tip might be useful to you, as well, great-artists-are-the-ones-who-practice ). Finally, you could always invite another friend into your creative group, one who loves to draw! Elves love to collaborate on projects. Erin, thank you for your question. All elves gather at certain times of the year for elven holidays. At a holiday event, we might see elves of every kind, including Pocket Elves (they are so cute!). Not infrequently, Santa will be seen in the sky, giving a sleigh ride to his elves, to help them arrive to the festivities on time. They live such a far distance to the north and his help makes their attendance at most celebrations possible. Tyler, if you keep in mind that it is normal and common to experience fear when you write, then you can let a fear come and go without worrying too much. When a fear surfaces in your mind, perhaps imagine feeding the fear to a giant fish in our workshop, and seeing it disappear! Every story doesn’t have to be brilliant or perfect. The most important thing is to practice writing stories. These two tips might be helpful. One is about savings pieces of stories in a journal (saving-pieces-of-stories) Remember, you don’t need to write a whole story. You can write down just parts in a journal. The other tip that we would recommend is this one, better-ideas-come-from-working-on-the-first-idea. One story really does lead to the next, and stories that you spend time on are never a waste! This tip explains why all stories are worth something to the writer. And let’s talk for a moment about place names! We like to look over the pages of an elven atlas and pick out place names. We might then change them by a letter or two, or turn them backwards! – add a word ending like -ville to the first word. Even a simple word like rabbit could become Rabbit Mountain or Rabbitsville. Or Tibbar, if you turn the word rabbit backwards. Or Tibbarville if you turn it backwards and add -ville. If you might have read any of the Harry Potter books, you will know the word muggle. As we elves understand it, Ms. Rowling invented that word from a shorter word, mug. In her home country of England, someone might call someone else a mug if they can be fooled easily. And muggle, Ms. Rowling thought, sounded sweeter than mug! Again, it was a matter of choosing a simple word, one that sounded fun and had a funny meaning, and just adding a new ending. Put your creativity to good use and keep writing! We wish you all the best! BlackShadow, it sounds like you are creating stories that travel on parallel tracks, tracks that do not cross. That is, all of the stories occur in the same world, but each story exists in its own book and the books are not connected (other than by the fact that they take place in the same world). If we have understood your idea, we think this is a fascinating idea. We don’t have anything to add. The concept is intriguing! The only suggestion we might have is to thoughtfully consider how much to take on at once. It is so encouraging to finish a story. Each time you finish a story, it builds your confidence. Knowing that you will finish what you start also encourages you to take on more ambitious stories, because you have more confidence to do so. Elves know that it can feel discouraging to start a story and not finish. The more a storyteller takes on at one time, the greater might be the chance that he or she will not finish the story. Therefore, we wondered if it might make sense to complete one story, while keeping notes on the others, and then proceed with those stories one at a time? Those sound like excellent characters and they should definitely be saved in a notebook—and the notebook should be saved in a safe place. Putting a character into a story just so the character can be used generally does not work in our experience. Elves believe that characters need to be called to a story. You, the author, can begin to develop an ear for these calls. The story will tell you what it needs. If you keep a journal of all of the characters you invent, and all of their profile details (details like being clumsy and bashful), then you can move on with creating stories and get characters out of the journal when you hear the story call for them. We have a writing tip about saving pieces of stories ( saving-pieces-of-stories ). Saving up characters is a very similar idea. Our friend Tristan from Palm Beach also asked about how to create names, and you will find some ideas on that topic down below! Meg, the naming of characters, the importance of these decisions, cannot be overstated. The name of a character is its beginning! The character now exists and the name shines a direction. We think these names sound very good. What is important, though, is what they conjure for you. When you think of Brea, do you begin to see what she looks like, what her temperament and character are like? And the same goes for Kelso. When you think of a character called Kelso, does he begin to come alive and take vivid shape? Is he sharp-tongued, quick-witted and ?? This is the true test of names: whether they begin to lead you to the character. We do have an elven tip on naming characters, what-to-name-your-characters. Also, we were not exactly sure if Brea was a female character and Kelso a male character. If we got that wrong, we apologize! Dear Anonymous, this is a very good question. Sometimes it is good to rewrite a story from scratch, because it allows you to make a fresh start and use only the parts that you really like and value. Your mind and your intuition can be trusted and relied upon to know what to save from the first draft. This tip, put-stories-away-to-sit-in-the-dark, is about putting stories away for a period of time and then reading them again to make final edits. However, this tip also might be of use to you when considering a rewrite. – work those into your new draft. The Pros and Cons list! We are so glad you asked this question! And the answer even lies within your question. As you described, there are advantages and disadvantages to many story decisions. How, then, are we supposed to decide? 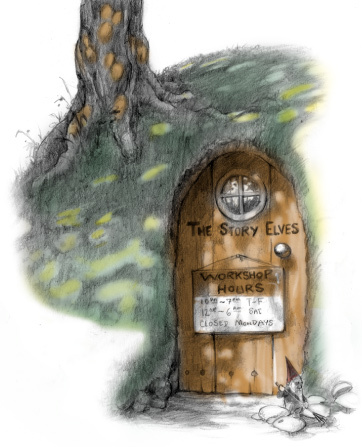 This is what elves do… Take a piece of paper, an owl quill pen, an ink pot and go to a nice quiet nook. Divide the paper in half with a line down the middle, and write “Pros” at the top of one side, and “Cons” at the top of the other side (with a line under each word). A pro is the “affirmative” side of an argument, why you would want to do something, while a con is a reason not to do something. Write down all of the pros and cons you can think of regarding whether two main characters should be related. Write down everything you can think of, even reasons that might seem trivial. Then, carefully read over your two lists and circle the pros and cons that stand out to you as important. At this point, your intuition usually tells you the answer. Tristan, many questions seem to be circling in your mind. It is very hard to reach a lot of goals all at once. Maybe, instead of thinking about a book, set a goal of writing a short story of a page and a half that is set on an island and has a new class of character, creatively similar to elves or mermaids, but totally original. Let’s start with the name of the island. Find an atlas, one that is printed. It is worth a trip out to the library if you don’t have a printed atlas. Once you locate an atlas, sit in a comfortable chair and turn to the index. Read the names. See what catches your eye. Truth can be stranger than fiction, and you might find the perfect place name for your story among the long columns of real place names. You could also blend names (take part of one place name and attach it to part of another place name), change a letter or two of an existing place name, or add a word like Gulch or Peak to a place name. Personally, in a human atlas, we like the sound of Wrangle Island. The word “wrangle” has an excellent meaning, by the way. As for thinking of a new class of characters, let us look more closely at the word mermaid and see what it reveals. It’s a compound word: mer + maid. The history of “mer” is interesting and connects back to the Middle English word for sea, which is mere, from the Latin mare. Finally, it is a brilliant idea to practice writing stories by incorporating ideas from stories you have read. Just as words break down into intriguing parts, so do stories! If you creatively use ideas that come from other stories, you will be making a story of your own. – this devastating destruction allows humans to move in and take over the elven territory. No matter what story puzzle you are currently trying to solve, try writing out short summaries like the one above. It will help you see your story as a series of steps or parts. Once you have these parts written out, you can decide if they make sense, if you need or want to add more parts, or if you need or want to change their order. You also might write out the parts and decide the story is too complicated, in which case a step can be removed. In any event, we feel the best way for the elves to avoid losing their cherished birthplace to encroaching humans might be for the elves to stay at home and bravely battle the sorcerer and his swamp dragon when they arrive… Elves do no like to see other elves lose their homelands! Joshua, the very first thing that jumps out at us from your question is: you know that you have great ideas! How fantastic. Take time to celebrate the fact that you have ideas! And keep some elven faith that the ideas will add up to something. and it is about saving whatever it is that you have. Get what you have down (in a journal, for example) and don’t worry about whether or not it is a complete story. As you build a collection of story pieces, and as you read them over while munching on a few chocolate and raspberry biscuits, you might suddenly see how a handful of your scribbled notes can come together to create a whole story. ( better-ideas-come-from-working-on-the-first-idea ). The title of the tip is a bit long, admittedly, but the tip is a good one. It is all about not worrying about what you write. Everything you write is practice. Even if a story ends up feeling messy, you are still practicing. As you practice more, the feeling of messiness will surely subside, and stories that are well arranged will begin to appear. Above all, keep writing! Creating stories is not easy, but the challenges don’t have to be frustrating or unhappy. They can just be challenges that you work on. Another friend who stopped into the workshop, Alaina, asked the same question. She is from Detroit, which is quite a ways from Blackpool. This question pops up all over. A great deal of who we are comes from who we think we are. So, in addition to the suggestion we gave to Alaina, we would say this to you: try imagining and believing you are an elf. What would you do differently? Gelila, let us dicuss your questions one at a time! It is an excellent idea to have talking in a story. Much can be described and imparted to readers in conversations between characters, and when characters think out loud. When you give a character a voice, you help the reader get to know him (or her). It is an excellent instinct to follow… let your characters express themselves through what they say, as well as what they do. This helps the story move! If you have a favorite television show, listen carefully to what characters say to each other. Most televisions shows are nearly all talking! How is the story in a television show created and advanced in loud arguments, whispered secrets, or a seemingly casual chat in a tree house? Studying what characters say in television shows and movies (not to mention listening to what people say in real life!) will help you with your own written stories. Elves, in truth, can be difficult to live with…loud, opinionated, and many with penchants for building things at odd hours. David, it may be better to befriend one than to have one. The elven answer to this question is: one sentence at a time. A novel is a big undertaking and we often do big things by breaking them down into smaller, more manageable parts. That is, instead of looking all the way into the distance to the end of the novel, maybe set your sights on the end of a paragraph or a page. That might feel easy. One page after the next, a novel appears. Setting up and following routines is also very important, so that we work consistently every day and create a habit and a pattern of making progress. We suspect that every type of story is possible! We like the sound of a story in which good things happen to good people and kind animals. Or, maybe a character starts out with circumstances that are just OK and ho-hum, and then the circumstances improve dramatically by the end of the story. That is, a story doesn’t have to go from bad to good, it might just travel from dull or ordinary to much better! Do not forget, though, that readers might identify with all manner of experiences and feel glad to see a range of experiences—good and bad—captured in a story. A reader might be comforted to find a story that brings some of their own story to light. For example, a reader might get an idea or be inspired to tackle something in a new way, all from a story that contains a misfortune. Therefore, as you work on stories in which nothing too uncomfortable befalls your characters, maybe also allow yourself the freedom to experiment with a few calamities. Characters do love to be triumphant, after all! Adversity often gives characters the chance to become bigger than they started. Ah, many must wonder about this. Elves live on every continent and major landmass in the world, as well as many islands, atolls and cloud formations. We are usually forest dwellers and some live above eye level, up in the forest canopy. Certainly keep an eye out for elves when you are in forested areas. You may encounter one among us when you least expect to. Allison, this is a good question because too much talking and not enough description could well make a story feel incomplete. What should you describe when you have two characters talking to each other? Try thinking this way: describe from inside to outside. For example, what are the speakers thinking and feeling but not saying? Feelings and thoughts are the “insides” of your characters and a reader may not know about the inside without descripiton. When describing the “outside,” consider writing about expressions that the characters are showing on their faces, what clothes they are wearing, how they are moving. Is one speaker pacing and another rocking back and forth in an old rocking chair? Readers will never know unless you describe the scene. You might also like the tip entitled see-pictures-when-you-write. If you stop to imagine pictures from your words, you will quickly see what details are missing from your descriptions. i) Start a story wherever you feel the most sure of the story. What you write down first may end up as the beginning or it could become the end. But it is very important to write down whatever you have in your mind and then build around it as you become more certain of the story. Whatever you do, be certain not to throw a piece of a story away because you don’t have the whole story! Keep all of the pieces, no matter how small. This tip, saving-pieces-of-stories might help you. ii) This is the other answer we would like to offer. Good stories very often begin with excellent details. It is up to you to decide what you want to be detailed about. You could introduce a character in a detailed way, a setting in a detailed way, or an event in a detailed way. Well-chosen details make stories vivid. Details quickly catch and hold the interest of readers. Details are very important to use at the start. Maya, the first audience we recommend writing for is you. When you enjoy your story, you will know it is a good one, as this tip explains, the-vip-in-the-audience. Once you have created a story you like, by all means, share it with others. Listen to their reactions and feedback—you may want to incorporate some new ideas… the ideas that you like. Keep in mind that not every reader likes every story. If only some people love your story, it was still a story worth writing. You gave pleasure to yourself and to others. You do not have to grow up before you become a writer, and you do not have to be paid a salary to call yourself a writer. Writers are people and elves who write. All writers go down the wrong road occasionally. There are very good reasons to start over. It is important to feel enthusiastic about what you are writing. Additionally, is important to feel like you have enough to write about. If you don’t feel enthusiastic and if you don’t feel you have enough to write about, your story might well be in trouble. Here is what we elves would suggest. Sometimes, finishing a story that is good enough is the right answer, especially if you are almost done. Every story we write will teach us something. Stories often lead to other stories, as you will see in this tip, better-ideas-come-from-working-on-the-first-idea. Then again, sometimes starting over is the right answer. If you have nothing left to write and the story is at a standstill, sometimes this is the right choice. Your teacher understands this situation and should therefore be consulted at a moment like this, to decide which path to take. If you don’t end up starting the new story right away, be sure to write the new idea down in a notebook! Good story ideas are like glittering gold nuggets. They hold their value! They can sit in a notebook, even for a long time, until you are ready to use them. Madeline, we are so pleased you have written so much that you have chapters! How glorious! i) If you feel like a chapter has gotten too long, end it and start a new one. ii) If you feel like a big event has concluded, end the chapter and start the next. Reading is an excellent way to learn about writing (take a look at this tip, read-write ). Spend a bit of time scrutinizing a chapter book, studying how the author ends and begins chapters. Above all, trust your intuition. If you feel like a chapter has ended, end it! Sometimes you really can’t keep a topic going for very long, because you didn’t really like it to begin with, or you don’t know much about it. If you work on selecting topics well, you will see the topics hold up well. — and what we think. What do you love, what do you find funny, what makes you feel sad, what do you imagine?